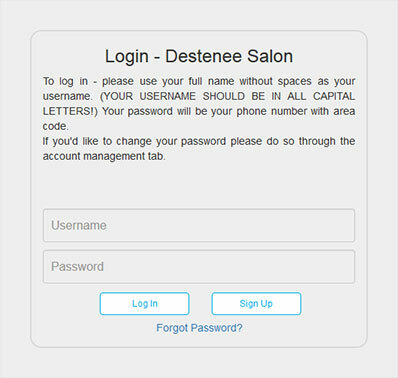 Destenee Salon offers scheduling appointments online for all our clients. We want our clients at Destenee to be able to schedule your appointment when it is convenient for you. Plus, it is a quick and easy way to see when your favorite stylist is available. Here at Destenee, we offer many salon services to schedule such as hair styling, coloring, highlighting, perms, special occasion styles, and Brazilian Blowouts. We are a group of talented stylists who work with Paul Mitchell hair care products to give you the best hair style possible. The stylists at Destenee Salon look forward to working with you while providing the best customer experience for your hair service needs. Destenee Salon, A Paul Mitchell Focus Salon, is passionately dedicated to the beautification of your body, mind and spirit. Our Luxury, Full Service Beauty Salon provides Professional Hair Styling and Hair Color Services. We guarantee satisfaction! I just discovered Bobbie at Destenee Salon a little over a year ago, and I couldn't be more pleased to recommend her. She is very professional and, at the same time, very friendly. She really knows her stuff regarding cut and color. Also very accommodating with scheduling. I'm here to stay! It was time for a new summer cut, and I went straight to Bobbie, because she listens to what I want. She is talented with the scissors and knows a lot about color and what would be appropriate for me. I highly recommend this professional woman. Hamza has been cutting my hair for nearly 10 years. Now and again over the years, I have gone elsewhere while traveling or when in need of an immediate cut and usually end up coming back to him the next month to fix whatever damage was done. He and Bobbie are good people and I'd argue are two of the best hair care engineers in the area. Bobbie is very experienced and an incredible stylist. Importantly, she listens to what I would like to do with my hair and helps me to achieve that goal (as much as possible!) from appointment to appointment. Hamza has been doing my hair for about a year now and always does a great job. I was worried when I moved down here about finding a new hairdresser because I had been with my previous one for over 10yrs. Hamza is very professional and knowledgeable about hair and I always feel like a millions bucks when I leave there!